The Korean National Cancer Center joined hands with the U.S. National Institutes of Health to launch a large-scale precision medicine research cohort to combat cancer, the NCC said Wednesday. The cancer research cohort aims at conducting joint precision medicine research on cancer and the Middle East respiratory syndrome. “The NCC hopes to establish a large-scale precision medicine cohort on cancer, which can be used in the future real-time policy of national cancer management,” the NCC said in a statement. 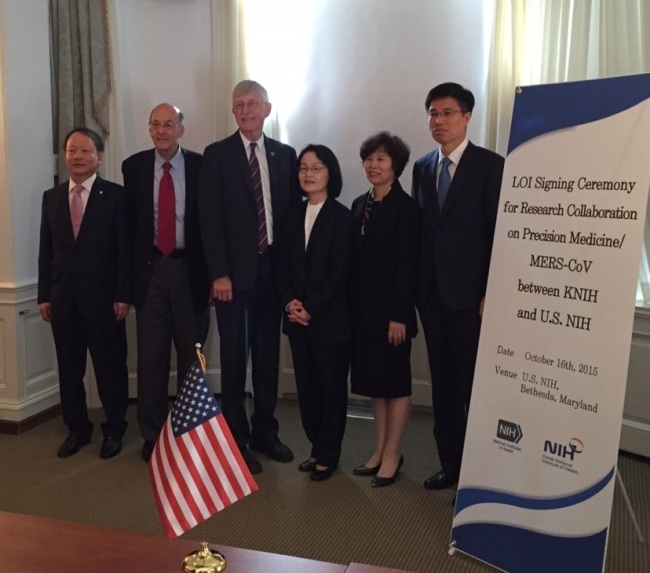 KNIH signed a cooperative agreement with NIH director Francis S. Collins at the U.S. institute’s headquarters in Washington. Following the agreement, NCC discussed detailed plans for cooperative measures. “We aim at creating strong ties with the U.S. for a state-supported prevention system of intractable cancer by combining big data and smart care,” the NCC said in a statement. The NCC seeks to set up a database of medical records of its 1.2 million patients who have suffered or survived cancer. Once the database is complete, the NCC plans to analyze the “big data on cancer” for preventive measures and post-recovery treatment of the disease. At the beginning of the year, U.S. President Barack Obama vowed to spend $215 million in amassing genetic data on 1 million or more Americans, a plan aimed at discovering genetic causes of diseases and finding new drugs that will target dangerous mutations.